It’s time you started fishing with the power of CHIRP sonar. The easy-to-install, easy-to-use 5-inch echoMAP CHIRP 55dv includes transducer for high wide CHIRP sonar and Garmin CHIRP DownVü, the clearest scanning sonar on the water. 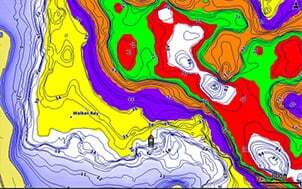 It includes Quickdraw Contours software to instantly create your very own HD maps with 1-foot contours as you fish. Internal 5 Hz GPS updates position and heading 5 times per second. It provides NMEA 2000® support for engine data, sensors, FUSION-LINK™ audio system, autopilots and more. Cords plug directly into the mount, allowing you to quickly install and remove your device from power and mount. Transom and trolling motor mounts included. The built-in sonar capabilities of echoMAP 55dv include CHIRP sonar, the most sophisticated sonar technology available for the fishing and boating public. CHIRP sonar provides amazingly clear target separation and definition because it puts even more energy onto the target than traditional sonar. It also includes sonar-recording capability that coordinates the timing of the sonar return with your boat's position and saves digital information for playback on a computer using HomePort™ planning software. Use the user data sharing cable to share waypoints and routes between multiple devices. Garmin CHIRP DownVü scanning sonar give you a nearly photographic image down to 750 feet below your boat. You clearly see structure, submerged objects and fish. Traditional Garmin HD-ID™ sonar and DownVü scanning sonar are combined into 1 transducer. Also provides HD-ID support for Minn Kota® and MotorGuide® trolling motors with integrated transducers. These highly detailed freshwater maps include 13,500+ Canada lakes, rivers and reservoirs, including coverage for the Great Lakes and Trent Severn Waterway. That number also includes more than 1,600 HD lakes with 1-foot contours shore to shore in Alberta, British Columbia, Nova Scotia, Ontario, Quebec, Saskatchewan and Yukon provinces. Canada LakeVü HD gives you excellent detail of underwater features, plus Shallow Water Shading allows you to designate a minimum depth. It also shows interstates, highways, general roads and bridges, designated fishing areas, docks, boat ramps, marinas and campgrounds. Quickdraw Contours is a free, easy-to-use software feature already installed on your echoMAP CHIRP 55dv. It instantly creates your own personalized HD fishing maps on screen with 1-foot contours. Tailor the maps as needed; you own them. Keep the data for yourself, or share it with Garmin or your friends. No special surveying expertise is required. You just fish while Quickdraw Contours creates maps. There’s no waiting around or sending your files away like other mapping software requires — your results appear instantly. Use with any Garmin Panoptix™ transducer, any HD-ID sonar, any CHIRP-enabled, Garmin DownVü transducer or NMEA 2000-compatible depth transducer. Have more than 1 sonar device installed onboard? Quickdraw Contours automatically selects the most capable sonar device to provide the very best results for you. Fast, responsive 5 Hz GPS/GLONASS refreshes your position and heading 5 times each second to make your movement on the screen more fluid. Now it’s quick and easy to drop up to 5,000 accurate waypoints and find your way back to your secret fishing hot spots. When you’re off the water, it’s easy to keep your echoMAP safe and secure. You don’t have to mess with plugging and unplugging wires from the unit because the cords plug directly into the mount. This allows you to quickly install and remove your echoMAP from power and the mount. A single microSD™ card slot provides expandable memory for accessory map purchases such as CanadaLakeVü HD Ultra, BlueChart® g2 or BlueChart® g2 Vision®. Canada LakeVü HD Ultra adds high-resolution relief shading, Dynamic Lake Level and Depth Range Shading. It also provides exclusive Garmin Auto Guidance, a technology that directs you to your hot spots. Based on your boat’s specifications, Auto Guidance instantly creates a visual path you can follow to avoid shallow water and other charted obstructions. Just enter the location where you want to go and patented Garmin Auto Guidance technology instantly searches through relevant charts to create a safe, virtual pathway on the display that helps you avoid low bridges, shallow water and other charted obstructions en route. With enhanced Version 2.0, you have access to more features and capabilities. You’re able to adjust the calculated Auto Guidance pathway by inserting “via” points at interim stops or landmarks along your desired route. You can easily review hazard points along your calculated path. And you can even engage your compatible Garmin autopilot to follow the Auto Guidance route, automatically. Other 2.0 enhancements give you the ability to calculate arrival times at any point on your route (great for timing arrivals to correspond with bridge openings and other time-critical events). Better still, you can now save your plotted Auto Guidance paths for future navigation by backing them up on an SD™ card with your BlueChart g2 Vision or LakeVü HD Ultra cartography¹. If you have waypoints, tracks or frequently used routes stored on another manufacturer’s GPS product - or on a Garmin handheld device - now it’s easier than ever to transfer those items to your new Garmin chartplotter, via industry-standard GPX software formatting. GPX is an open standard format for GPS data exchange across platforms and applications. With this easy-to-use interface technology, Garmin has taken “no waypoint left behind” to a whole new level of trade-up convenience. Designate up to 10 different depth ranges each with its own color. Makes it easier to view target depths at a glance. To make commissioning easier and more convenient, you can handle the entire autopilot commissioning process from your chartplotter screen. Enjoy the ability to control all compatible FUSION-Link-enabled audio systems directly from your compatible chartplotter display. Supported SailAssist features include laylines, enhanced wind rose, heading and course-over-ground lines and true wind data fields. Gauge displays are designed to provide important, need-to-know information at a glance, including true and apparent wind angle, set and drift, true or apparent wind speed, horizontal graphs and a data bar with customizable data fields. To help you gain a wind-maximizing competitive edge, your chartplotter features a pre-race guidance page that shows your virtual starting line, along with data fields showing laylines, time to burn before the start and a race timer. ¹BlueChart g2 Vision or LakeVü HD Ultra SD card is required for this technology.